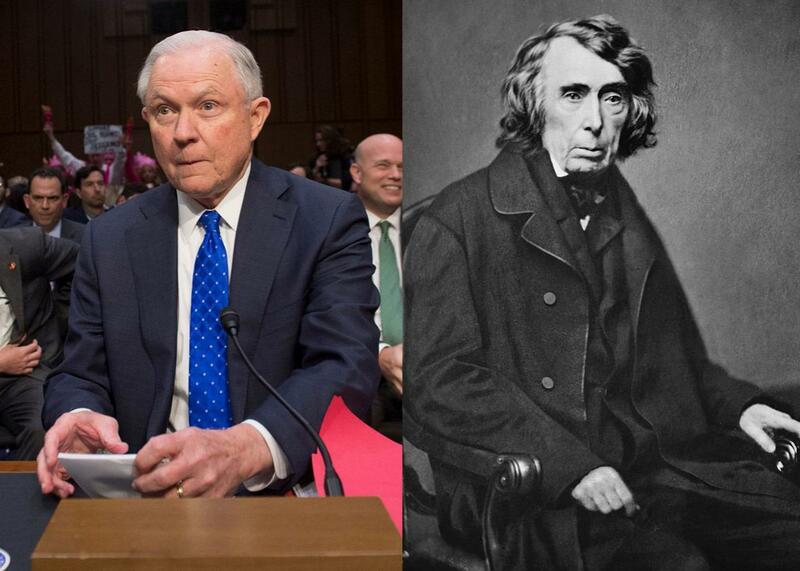 The Justice Department’s radical new anti-abortion stance echoes Dred Scott. In a case about the abortion rights of undocumented minors, the Department of Justice evokes the worst Supreme Court decision of all time. Throughout his presidential campaign, Donald Trump maligned undocumented immigrants as violent criminals and sexual predators who deserved to be rounded up and deported. Once in office, Trump transformed this rhetoric into policy, implementing a nationwide crackdown on immigrant communities. Now, the president’s dehumanizing disparagement of undocumented people has seeped into his administration’s legal positions. This week, the Department of Justice is arguing in court that undocumented, unaccompanied minors have no right to abortions—and that undocumented immigrants may have no constitutional rights at all. This argument does not only contravene Supreme Court precedent. It also draws upon an inhuman notion of constitutional liberty most notoriously espoused in Dred Scott v. Sandford. The Justice Department’s radical new theory arose out of a disturbing case in Texas that revolves around a 17-year-old referred to as Jane Doe in court filings. Doe arrived in the United States several months ago, unaccompanied by her parents and lacking documentation. She was placed in a federally funded Texas shelter, at which point she learned she was pregnant. Doe requested an abortion, but under state law, minors cannot receive the procedure without either parental consent or judicial approval. So Doe obtained what’s known as a judicial bypass and asked permission to attend a state-mandated counseling session before undergoing the procedure. Her shelter refused to allow her to attend that counseling session, citing federal regulations promulgated by the Office of Refugee Resettlement, a wing of the Department of Health and Human Services. In March, ORR announced that federally funded shelters could not take “any action that facilitates” abortion for unaccompanied minors, including “scheduling appointments, transportation, or other arrangement,” without “direction and approval” from Scott Lloyd, the agency’s director. A Trump appointee and longtime anti-abortion activist, Lloyd has refused to allow minors to access abortion services. Instead, he has directed shelters to take these women to “crisis pregnancy centers,” which “counsel” them not to get abortions. At least once, Lloyd himself called a pregnant minor to talk her out of terminating her pregnancy. If a minor still wants to get an abortion after navigating these obstacles, ORR instructs its shelters to block her from attending her appointment. Doe’s shelter followed these guidelines, taking her to a crisis pregnancy center and calling her mother to tell her Doe was pregnant. But Doe persisted, and in October, her court-appointed attorneys filed suit along with the American Civil Liberties Union in a federal district court in Washington, where ORR is headquartered. Doe argues that ORR’s rules violate her constitutional rights by placing an undue burden on her access to abortion. Chutkan ruled against the government and issued a temporary restraining order guaranteeing Doe the ability to terminate her pregnancy. (She is currently 15 weeks pregnant, and abortion is illegal after 20 weeks in Texas.) The DOJ appealed to the U.S. Court of Appeals for the District of Columbia Circuit, which will hear arguments in the case on Friday morning. In its motion, the agency argued that the government’s “interest in promoting fetal life and childbirth over abortion” justified its refusal to let a minor go to an abortion clinic. It also claimed that, even if undocumented minors have a constitutional right to abortion care, the administration was not unduly burdening that right, because minors who want to terminate their pregnancies can leave the country. This argument is merely another way of stating that women like Doe have no right to an abortion in the United States. By excluding undocumented immigrants from the protections of Planned Parenthood v. Casey, the Trump administration is essentially asserting that they do not qualify as “person[s]” under the Due Process Clauses of the Fifth and 14th Amendments. The Supreme Court has ruled that the liberty component of the Due Process Clause protects a woman’s right to terminate her pregnancy without a substantial obstacle. If arbitrary regulations that severely burden clinics qualify as such an unconstitutional obstacle, as the Supreme Court has held, then surely self-deportation does as well. Thus, the sole plausible interpretation of the DOJ’s posture is that the Due Process Clause does not protect undocumented women like Doe. Put simply, undocumented women are not people for constitutional purposes. Following the Civil War, Dred Scott was overturned by the 13th and 14th Amendments. These amendments ensured that everyone born in the United States would be a citizen. They also granted all “person[s]”—not just citizens—due process and equal protection under the law. Trump has already raised the specter of Dred Scott through his call to end birthright citizenship, the constitutional command that lay at the heart of the Civil War amendments. Now his administration is invoking the decision again in its attempt to deprive undocumented immigrants of their personhood under the Constitution. If excludable aliens were not protected by even the substantive component of constitutional due process, as the government appears to argue, we do not see why the United States government could not torture or summarily execute them. … [W]e do not believe that our Constitution could permit persons living in the United States—whether they can be admitted for permanent residence or not—to be subjected to any government action without limit. Perhaps recognizing the extremism of its argument, the Trump administration has left open the possibility that undocumented immigrants are entitled to some unspecified “minimal standards” of constitutional protection. But if those minimal standards don’t include the basic right to bodily autonomy, then the 6th Circuit’s query still stands. If the government can force Doe to carry her pregnancy to term against her will, what can’t it do? The administration’s attempt to exert complete control over Doe’s reproductive system is a straightforward deprivation of constitutional liberty that opens the door to equally egregious future abuses. On Friday morning, the Justice Department will return to court once more to argue, in effect, that Jane Doe is not a “person” worthy of due process protections. It might as well cite Dred Scott for the proposition that the government may strip undocumented immigrants of their constitutionally protected liberty. The 14th Amendment was designed to end such capricious discrimination against individuals living in the United States. But to the Trump administration, immigrants like Doe aren’t even people—just possessions of the state, awaiting deportation.